Run out of drink?! That’s hideous at the best of times. But at your wedding?! It really doesn’t bear thinking about does it…? Ugh. If you book your wedding with us, you can bring your own drinks, we don’t charge corkage (I know, how fab is that?!). It’s one of the biggest dilemmas for planning a wedding – how much drink do we need? And for some couples, despite their best guesses, they don’t get it right and they run out. Sounds like a disaster right? So here are a few examples of what’s happened this year and why it isn’t a worry if you’re an Ever After couple and you’ve got the Ever After ninja wedding team behind you. There are no names, no pack drill here. I’m not in the business of naming and shaming, just trying to show you that you don’t need to worry if the worst that can happen – actually darn well happens. The groom was in charge of ordering and bringing the drinks. The day before the wedding (when our couples get to check in) he arrived with a car load of drinks and said there would be more to drop off the next day. No problem, we loaded everything he’d bought into the fridges to chill overnight. Next day the groom arrives with more drinks. Great! ‘Where are the soft drinks?’ Uh… oh dear. No soft drinks at all. A groom obviously has a shed load of stuff to do on the morning of a wedding and going round Morrisons with a trolley is not one of them. Getting into your wedding kit and turning up on time should be THE ONLY thing on that list. Again I didn’t tell the couple on the day, I just sorted out the finances with them the day after – a straight reimbursement on cost, no extra charge at all. The beer was running out. 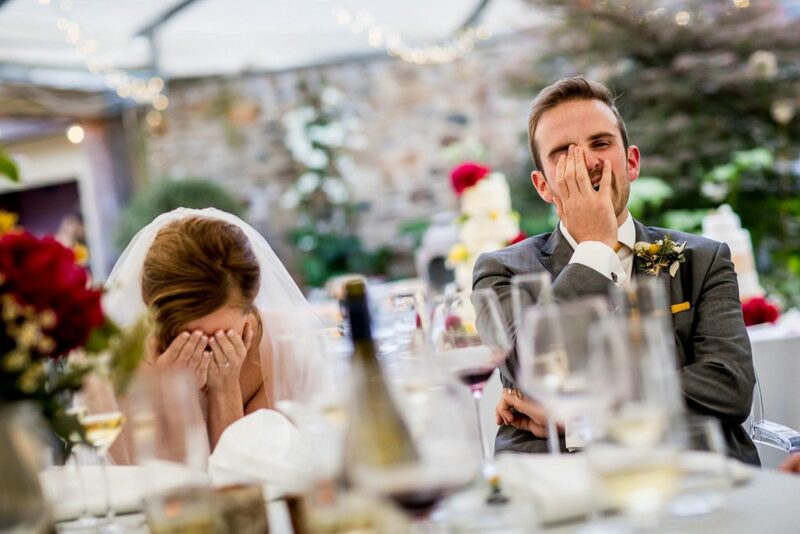 It was a hot day and guests were drinking much more than the couple anticipated. There was nothing for it, the lovely S drove to Morrisons and loaded up. Problem solved. We did tell the groom that time, he confirmed he wanted us to get more beer but said if they drank all the second lot too, that was it. Up til now we’ve had no alcohol licence and couples have either brought in their own drinks or they’ve hired a mobile bar supplier. Lots of our couples have asked us if we have a drinks package (we don’t) but what we’ve been hearing is that they want us to take this big hassle off their plates. So we asked some of our couples what they would have wanted to see if Ever After did offer a drinks package. So we listened and we heard. And we’re introducing our own wedding drinks package for 2018 and we’ll be putting the deets out shortly. Trust me when I say they’re going to be such great value, no-one will be hiring in outside bar suppliers. You’ll be able to keep it all under the Ever After roof and know you’re getting a great deal. But it’s even better than that. Because even with the new packages, you can still bring your own drinks if you want to and we will never charge corkage. Cheers…! Click here to download our ideas for gorgeous reception drinks to wow your guests.